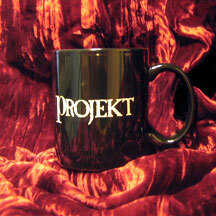 11oz C-Handle glossy black coffee mug with the PROJEKT LOGO in white. We are out of the black mug, but we do have this mug in Cobalt Blue. Both are lovely! Because of the weight of the mug it must be shipped PRIORITY MAIL. If you choose first class, we will adust accordingly.